Providing music lessons to all kids K though 8. Hope Academy is a local public charter school that serves an overwhelmingly low- income population in K-8th grade. The school fosters a hands-on learning philosophy and strong focus on academic success, enrichment and civic engagement. Our music program was successfully started in the 2014/2015 school year. The program is taught by professional musicians and educators from Lakehouse Music Academy who emphasize the importance of educating the local youth. believe the best way to reach the greatest number of students is by offering musical education right in our schools. Also offered is an after-school component that addresses an important concern in our community: keeping kids safe and engaged during those hours when they are most at risk. This program is funded through the generous donation from the Jules L. Plangere, Jr. Family Foundation. 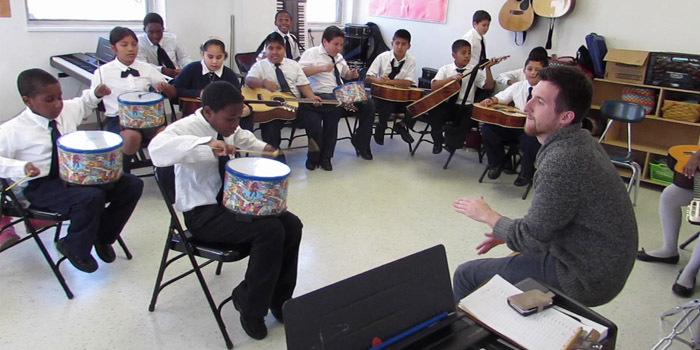 This program is part of the Music Saved My Life youth music education initiative, which is a partnership between the Asbury Park Music Foundation and Lakehouse Music Academy.